A Day on the Green concert events at Bimbadgen has become a fixture since we first broke ground in season 2002 – 2003, with local and international artists appealing to all generations. Our amphitheatre holds up to 10,000 people with one of the most stunning backdrops of any outdoor music event in the country. From November to April, come along and watch your favourite artists. Experience A Day on the Green from the all-inclusive Bimbadgen Concert & Dining Marquee. 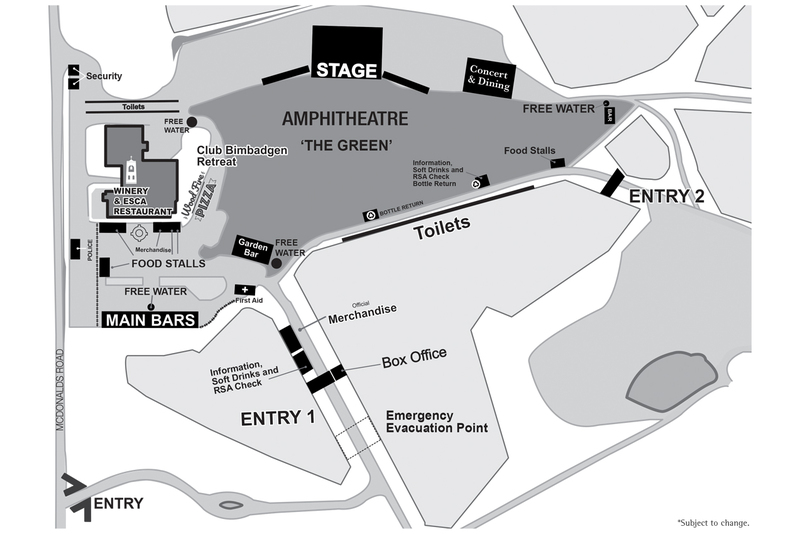 This package includes a serviced bar and dining area in a deluxe marquee at the perimeter of the venue, and a Platinum Reserved seat ticket within the Bimbadgen amphitheatre. Enjoy the ultimate food and wine experience at A Day on the Green this concert season. Secure your place within the exclusive surrounds of Esca Bimbadgen restaurant. Upgrade your General Admission or Seated ticket and reserve your place at Bimbadgen’s ‘Garden Bar’. Enjoy access to a private retreat including dinner and private bar facility. Enjoy a hamper prepared by Esca Bimbadgen which comes complete with a re-usable Bimbadgen Hamper Bag, 2 x re-usable polycarbonate wine glasses and a bottle of Bimbadgen wine.